I'm sorry but your browser does not support the HTML5 Audio element. 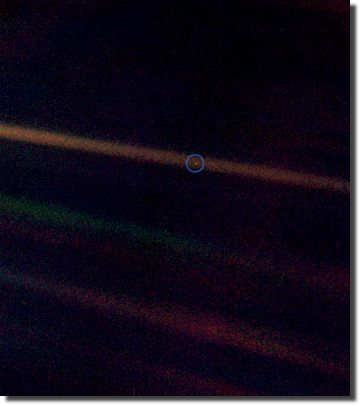 Seen from 6.4 billion kilometres away, Earth is a dot obscured in a beam of scattered sunlight (pinpointed by artificial blue circle). So here they are — a mosaic of squares laid down on top of the planets and a background smattering of more distant stars. We were able to photograph not only the Earth, but also five other of the Sun's nine known planets. Mercury, the innermost, was lost in the glare of the Sun, and Mars and Pluto were too small, too dimly lit, and/or too far away. Uranus and Neptune are so dim that to record their presence required long exposures; accordingly, their images were smeared because of spacecraft motion. This is how the planets would look to an alien spaceship approaching the Solar System after a long interstellar voyage. From this distance the planets seem only points of light, smeared or unsmeared — even through the high-resolution telescope aboard Voyager. They are like the planets seen with the naked eye from the surface of the Earth — luminous dots, brighter than most of the stars. Over a period of months the Earth, like the other planets, would seem to move among the stars. You cannot tell merely by looking at one of these dots what it's like, what's on it, what its past has been, and whether, in this particular epoch, anyone lives there. Because of the reflection of sunlight off the spacecraft, the Earth seems to be sitting in a beam of light, as if there were some special significance to this small world. But it's just an accident of geometry and optics. The Sun emits its radiation equitably in all directions. Had the picture been taken a little earlier or a little later, there would have been no sunbeam highlighting the Earth. And why that cerulean color? The blue comes partly from the sea, partly from the sky. While water in a glass is transparent, It absorbs slightly more red light than blue. If you have tens of meters of the stuff or more, the red light is absorbed out and what gets reflected back to space is mainly blue. In the same way, a short line of sight through air seems perfectly transparent. Nevertheless — something Leonardo da Vinci excelled at portraying — the more distant the object, the bluer it seems. Why? Because the air scatters blue light around much better than it does red. So the bluish cast of this dot comes from its thick but transparent atmosphere and its deep oceans of liquid water. And the white? The Earth on an average day is about half covered with white water clouds. We can explain the wan blueness of this little world because we know it well. Whether an alien scientist newly arrived at the outskirts of our solar system could reliably deduce oceans and clouds and a thickish atmosphere is less certain. Neptune, for instance, is blue, but chiefly for different reasons. From this distant vantage point, the Earth might not seem of any particular interest. But for us, it's different. Look again at that dot. That's here. That's home. That's us. On it everyone you love, everyone you know, everyone you ever heard of, every human being who ever was, lived out their lives. The aggregate of our joy and suffering, thousands of confident religions, ideologies, and economic doctrines, every hunter and forager, every hero and coward, every creator and destroyer of civilization, ever king and peasant, every young couple in love, every mother and father, hopeful child, inventor and explorer, every teacher of morals, every corrupt politician, every "superstar," every "supreme leader," every saint and sinner in the history of our species lived there — on a mote of dust suspended in a sunbeam.